Club Penguin Cheats by Mimo777 Club Penguin Cheats by Mimo777: Disney’s Club Penguin - Biggest Social Network for Kids! 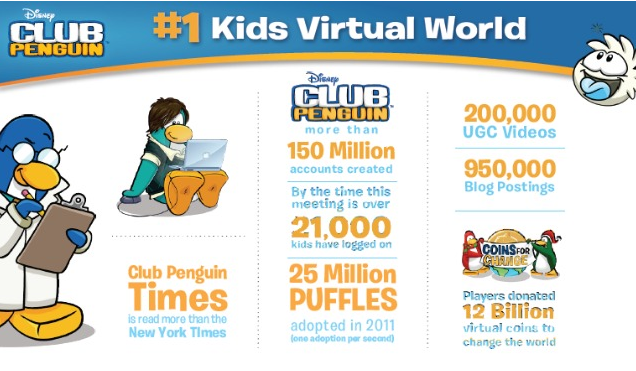 Disney’s Club Penguin - Biggest Social Network for Kids! With more than 150 million profiles and a digital newspaper that’s read almost as much as The New York Times, Club Penguin might be the biggest, most improbably successful social network for kids ever. Club Penguin is part game site, part educational resource, part social network all centered around a fictional world made up of user-created penguins which act as avatars for the millions of kids (generally 8- to 11-year-olds) from more than 190 different countries around the world. The site, which is part of Disney Digital and run by Lane Merrifield, the evp of Disney Online Studios, has become a huge success thanks to it appeal to young kids and parents alike. Club Penguin is all about creating a digital space where kids can play, participate in events and socialize. The site hosts regular contests, online meetups, “concerts,” digital events (like a site-wide sports tournament), and an official newspaper called “The Club Penguin Times” which is read by more than 1.1 million kids. All of this compliments the informal meetups and list of titles such as Card Jitsu, a simple card game. Merrifield compares Club Penguin’s success to a swing set in a schoolyard. During recess and after school the swings are swamped but you never see a line during down hours: “A lot of the fun is in social engagement,” Merrifield says. Club Penguin is like a digital swingset where kids can play and gather around communal events. It’s also good for parents hoping to teach their kids a thing or two. Merrifield says the site actually helps kids improve their typing, reading and writing since so much of the site is understood through language. Auto-complete and predictive sentences help kids put together simple phrases and even learn new languages. Club Penguin is available in five languages (English, German, French, Spanish and Portuguese) even though about 40% of the users come from the U.S.
All of the in-game signs, instructions and even predictive dialogue can be translated to any of those five languages. Some parents have allowed their kids to play for 30 minutes, for example, if they play for 20 minutes in a different language. It also means that kids from different countries can speak to each other in their own language. The site also has other parental features like a “timer” which automatically limits how long a child can stay logged in. The site also promotes other lessons in responsibility, like how to take care of pets or keep a job. Players can adopt “Puffles” as companion pets, for example. These pets need to be fed and taken care of otherwise they run away. More than 25 million Puffles were “adopted” this year alone. Philanthropy plays a surprisingly large part in Club Penguin. Every year the site donates $1 million to charity. This year it has doubled that amount to $2 million to provide medical care, improve the environment and resources for kids around the world. The program, called Coins for Change, is actually driven by the users. Players are given a certain amount of coins which they can use to upgrade and buy items in-game. They can also donate those coins to in-game charities. These donations act as a kind of vote. 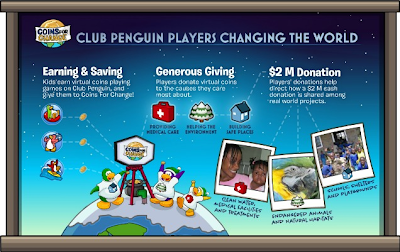 The in-game causes with the most support influence where the Club Penguin team donates its actual dollars. In 2010, more than 3.4 million kids donated more than 12 billion virtual coins to charity. “We wanted to get the kids involved, we wanted them to learn the spirit of giving back,” Merrifield says. It’s a lesson that parents and kids can both appreciate. “The parents pay, so its really about keeping them happy,” Merrifield says. Club Penguin makes most of its money off subscription plans which range from $7.95 for one month to $59.95 for a year (about $5 a month). There is also a ton of real-world merchandise that, when bought, can be scanned into the site thanks to unlock codes on every product. That money helps pay for a ad-free experience as well as a staff of more than 200 safety and security personnel which monitor the interactions and even wander the digital world as one of Club Penguin’s characters (only after going through two to three weeks of training similar to mascot training at Disney Parks). Club Penguin has all the trappings of a successful Disney franchise — charming characters, vaguely educational undertones and a strong emphasis on merchandise. The site, more than its language lessons and games, is teaching kids how to navigate social networks in a safe way. It’s a site for kids that satisfies adults for a relatively small fee. And just like a swing-set at recess, Club Penguin continues to draw long lines of wide-eyed users. Is a site like Club Penguin a good teaching tool or a Disney cash grab? Sound off in the comments below. Whoa! How cool is that? So, what do you think? Is Club Penguin a fun social site, a good educational game, or just a good money maker for Disney? Gary Sends Club Penguin EPF Message! Club Penguin Pin Cheat - CANDY SWIRL PIN! Club Penguin Field Op Number 62 Cheats! Club Penguin Times Issue #323! Club Penguin New Year Fireworks! Club Penguin Home Page Updated! Club Penguin Coins for Change Video! Club Pengin FREE Item Codes! Coins For Change Goal Reached! Merry Christmas From Mimo and Club Penguin Gang! Club Penguin Mobile App Update! 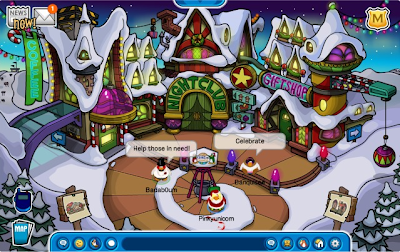 Club Penguin Field Op Number 61 Cheats! 2011 Deck The Halls Igloo Decorating Contest! Club Penguin Times Issue #322! CP Parents Twitter Promotes Puffles! Club Penguin Coins For Change Update! Club Penguin 12 FREE Gifts Video! Club Penguin Nowie Awards Nomination! Club Penguin Puffle Launch Update! Club Penguin You Tube Banner Changes! Club Penguin Christmas Party FREE item! Club Penguin Pin Cheat - REINDEER PIN! Club Penguin Field Op Number 60 Cheats! Club Penguin: "A Humbug Holiday" at the Stage! Club Penguin Give A Gift Postcard! Club Penguin Times Issue #321! Club Penguin Start Up Screen and Homepage Update! Christmas Party Sneak Peek Video! Club Penguin Drawing Reviewed By You! Get Your Profile Page on FUNHOUSE! Club Penguin Coins for Change! Club Penguin EPF Message From Dot! Club Penguin Parent Page Update and GIFTS! Club Penguin December Parent Update! Club Penguin Field Op Number 59 Cheats! Club Penguin Martial Artworks Catalog Update! Club Penguin Time Issue #320! Club Penguin Ice Rink Returns! Club Penguin December Membership Page! Club Penguin Shadow Dojo EXCLUSIVE! Club Penguin Parent Twitter Account! Club Penguin Happenings by Happy77! Find Sensei With Mimo Tracker! Club Penguin's First Animated Short! Club Penguin Coffee and Card-Jitsu Video! Club Penguin Pin Cheat - BONSAI TREE PIN! Club Penguin Field Op Number 58 Cheats! Club Penguin Times Issue 319! Rockhopper Returning to Club Penguin! Club Penguin Ice Rink Coming Soon!